Wander into the woods with us as we explore the earthy themed details in this woodland themed boy’s 1st birthday party! Creative mom Christina Hutchinson styled this adorable party idea for her son. She incorporated a mix of woodsy, forest inspired details into both her dessert table and decoration choices. The printable items she designed add a sweet touch and pull all of the creative elements together. Her longtime family photographer, Nine Photography, captured all the magic of the day. 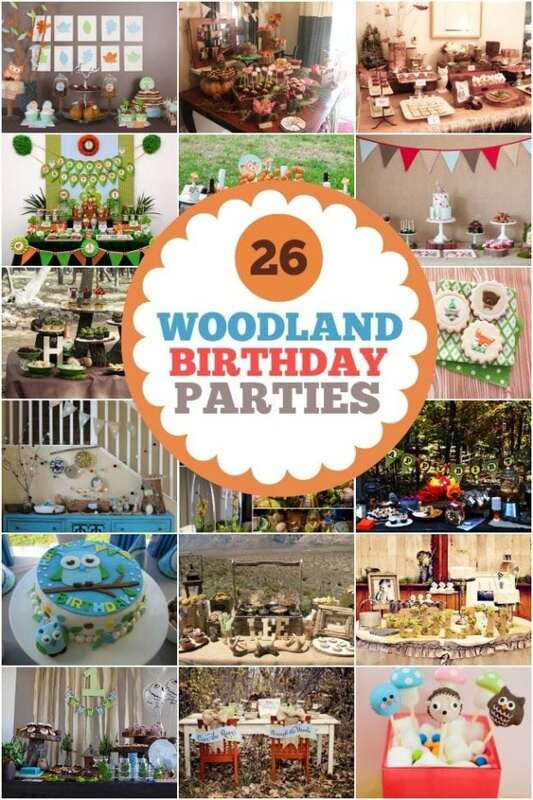 See Also: Get plenty of woodland party inspiration in this roundup of 26 woodland themed boy party ideas. The woodland inspired theme enticed from the moment guests arrived at the front porch. 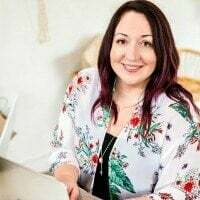 Christina, of Catiebug Designs, created a darling “welcome forest friends” sign with the cutest kid-friendly forest animals. The birthday boy was dressed for the occasion wearing a darling “let’s roast mallows and party s’more” shirt and also pants from Little Lotus Organics — that just so happened to coordinate well with the patterns on the invitation. You will notice the fabric matching the pants was used on the brunch table, too. Several areas around her home were decked out in color coordinating décor, mostly handmade by Christina. A gift table was established underneath the fireplace mantle, accented in colorful paper fans, faux trees and greenery. A custom “gifts sign” and triangle bunting added a finished look to the space. Overhead, more triangle bunting tied the spaces together (side note: Can we talk about those incredible Mason jar lights? Love!). The highlight of the woodland party was most definitely the woodland brunch buffet. Christina used several rustic, natural items to create the feel of eating in the woods. Platters and rustic cake stands were mixed with wood rounds and moss covered tiered stands. Christina served a lovely brunch menu: bagels, donuts, fruit and yogurt, breakfast sausage squares, mini pancakes with bananas and strawberries on skewers (I especially like that presentation), and cinnamon roll pops. The chalkboard keepsake was a DIY project made from a store bought wood slice, painted with chalkboard paint. A friend of the family used her artistic skills to hand draw on milestones and one year stats with chalk pens. It made a cute, personalized addition to the buffet. Setting up a special place just for beverages is a fabulous idea. Christina styled an adorable “watering hole”, complete with a custom sign and a variety of drinks, printable wrapped water bottles, orange juice, iced tea and juice boxes. There were plenty of color coordinating paper cups and striped straws on hand, making it easy to keep hydrated. A brunch menu means a little dessert is definitely in order! The invitation and table fabric were inspiration for baking beautifully coordinating woodland themed cookies. Cupcakes were topped with the sweetest woodland animal toppers by The Sweet Life Cakery, who also did an amazing job on the fox smash cake for Myles. Apparently you’re not out of the woods, or in this case the woodland themed party, until you’ve snatched up a cute s’mores party favor with a darling note of thanks for making Myles’ party “S’more fun”. Do favors get any cuter? What a marvelous celebration of a first birthday party. this woodland theme is so much fun!